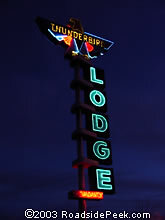 Why does it seem like motels and lodges named Thunderbird are all treasures? The is no disappointment with its neon thunderbird glowing through the night. 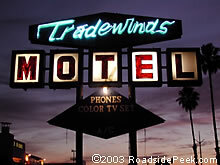 The sign for the Tradewinds Motel in Sacramento still advertises the fact that its rooms carry phones and color TV. Looks like the neon on this gem of a sign still works right. 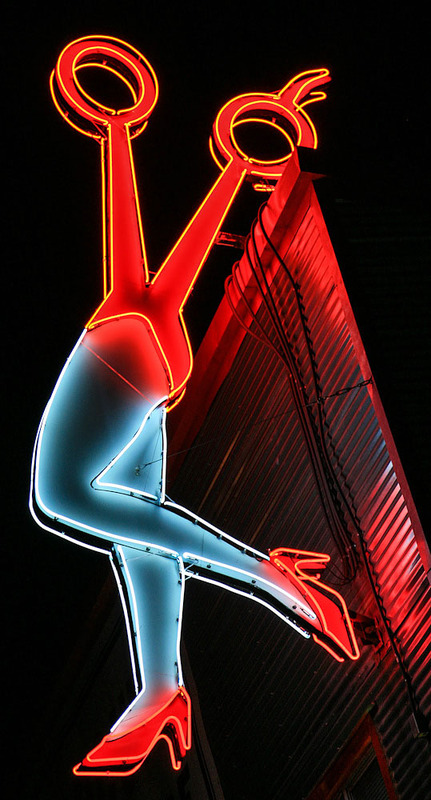 UPDATE : The neon on this old sign is history, though the sign itself still remains. The neon sign for the Cal Va Rado Motel leaves no pretension as to which state this place is located. Both of these neon signs still appear to be in fantastic working order. 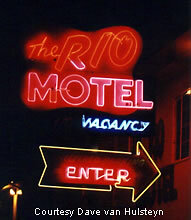 Check out the fine neon on this roadside motel, the Rio Motel of Oakland. The neon still lights up at the Travel Inn Motel in San Carlos. The Star Lake Motel advertises low rates among other things. 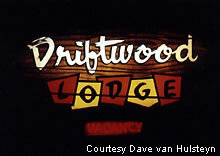 The Driftwood Lodge is also located in the center of the old roadside lodging in South Lake Tahoe.